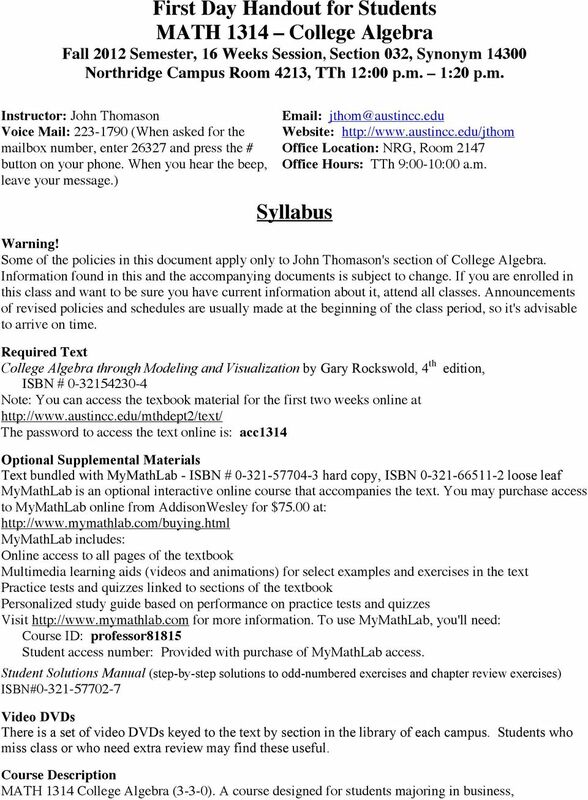 Download "Syllabus. Email: jthom@austincc.edu Website: http://www.austincc.edu/jthom Office Location: NRG, Room 2147 Office Hours: TTh 9:00-10:00 a.m."
2 (Thomason MATH 1314 College Algebra, p. 2 of 8) mathematics, science, engineering, or certain engineering-related technical fields. 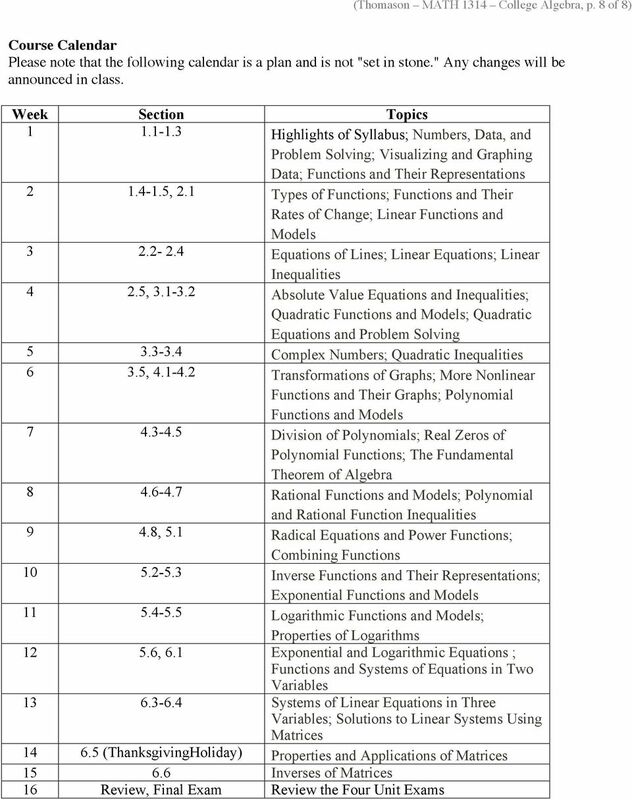 Content includes the rational, real, and complex number systems; the study of functions including polynomial, rational, exponential, and logarithmic functions and related equations; inequalities; and systems of linear equations and determinants. Prerequisites: MATD 0390 or satisfactory score on the ACC Assessment Test. (MTH 1743) Course Prerequisite The course prerequisite is Intermediate Algebra (MATD 0390) or current knowledge of High School Algebra I and II as measured by an assessment test. 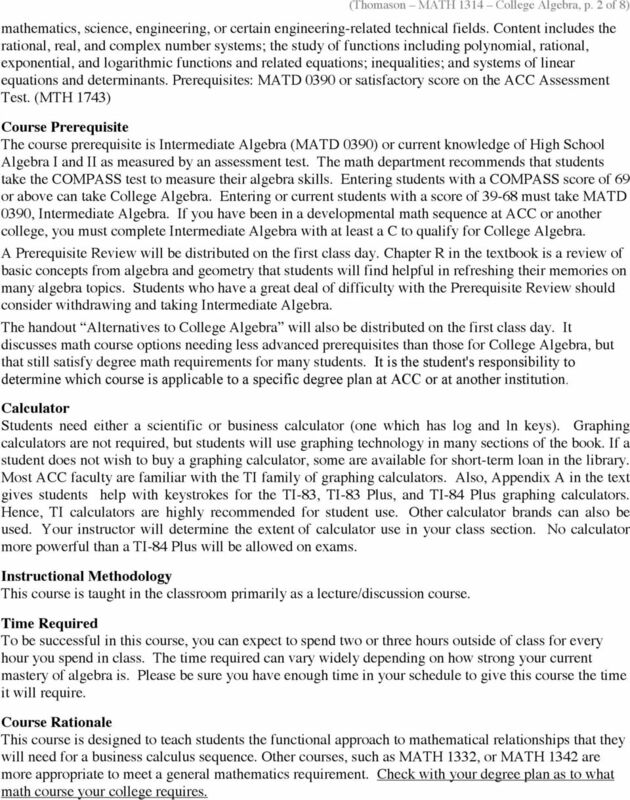 The math department recommends that students take the COMPASS test to measure their algebra skills. Entering students with a COMPASS score of 69 or above can take College Algebra. Entering or current students with a score of must take MATD 0390, Intermediate Algebra. If you have been in a developmental math sequence at ACC or another college, you must complete Intermediate Algebra with at least a C to qualify for College Algebra. A Prerequisite Review will be distributed on the first class day. Chapter R in the textbook is a review of basic concepts from algebra and geometry that students will find helpful in refreshing their memories on many algebra topics. Students who have a great deal of difficulty with the Prerequisite Review should consider withdrawing and taking Intermediate Algebra. 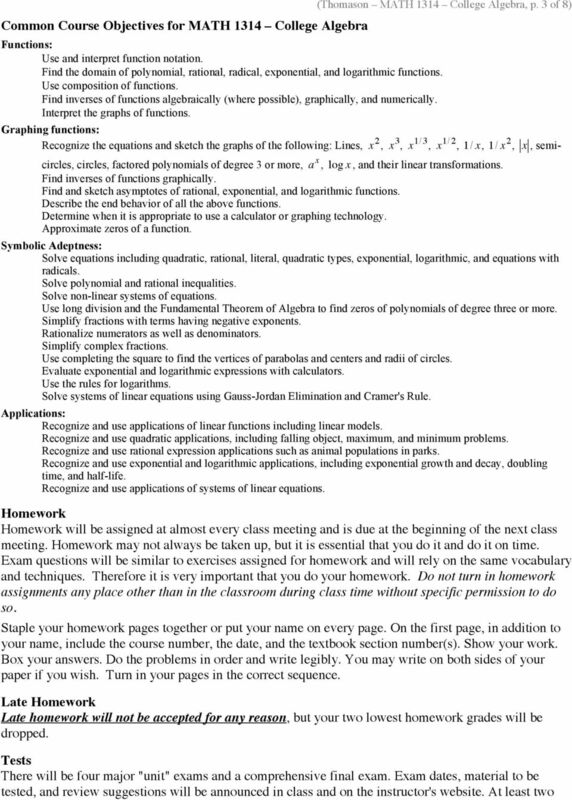 The handout Alternatives to College Algebra will also be distributed on the first class day. It discusses math course options needing less advanced prerequisites than those for College Algebra, but that still satisfy degree math requirements for many students. It is the student's responsibility to determine which course is applicable to a specific degree plan at ACC or at another institution. Calculator Students need either a scientific or business calculator (one which has log and ln keys). Graphing calculators are not required, but students will use graphing technology in many sections of the book. If a student does not wish to buy a graphing calculator, some are available for short-term loan in the library. Most ACC faculty are familiar with the TI family of graphing calculators. Also, Appendix A in the text gives students help with keystrokes for the TI-83, TI-83 Plus, and TI-84 Plus graphing calculators. Hence, TI calculators are highly recommended for student use. Other calculator brands can also be used. Your instructor will determine the extent of calculator use in your class section. No calculator more powerful than a TI-84 Plus will be allowed on exams. Instructional Methodology This course is taught in the classroom primarily as a lecture/discussion course. Time Required To be successful in this course, you can expect to spend two or three hours outside of class for every hour you spend in class. The time required can vary widely depending on how strong your current mastery of algebra is. Please be sure you have enough time in your schedule to give this course the time it will require. Course Rationale This course is designed to teach students the functional approach to mathematical relationships that they will need for a business calculus sequence. Other courses, such as MATH 1332, or MATH 1342 are more appropriate to meet a general mathematics requirement. Check with your degree plan as to what math course your college requires. 4 (Thomason MATH 1314 College Algebra, p. 4 of 8) unit exams and the final exam will be given in the classroom during regular classtime. At least one unit exam will be given in the Northridge Testing Center, Room Any test given in the Testing Center will be available there for several days and must be taken by the deadline specified by your instructor. ACC Testing Center policies can be found at: On some days, a short quiz may be given over the assignment due that day. If you are tardy you must turn in your quiz at the same time as students who arrived on time, which may result in a lower quiz grade. If you are absent on a day a short quiz is given, you will get a 0 for that quiz. 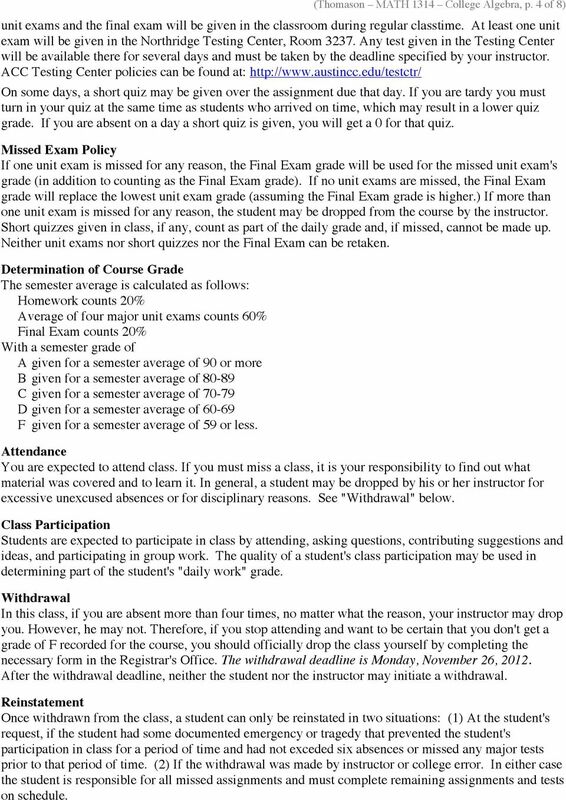 Missed Exam Policy If one unit exam is missed for any reason, the Final Exam grade will be used for the missed unit exam's grade (in addition to counting as the Final Exam grade). If no unit exams are missed, the Final Exam grade will replace the lowest unit exam grade (assuming the Final Exam grade is higher.) If more than one unit exam is missed for any reason, the student may be dropped from the course by the instructor. Short quizzes given in class, if any, count as part of the daily grade and, if missed, cannot be made up. Neither unit exams nor short quizzes nor the Final Exam can be retaken. Determination of Course Grade The semester average is calculated as follows: Homework counts 20% Average of four major unit exams counts 60% Final Exam counts 20% With a semester grade of A given for a semester average of 90 or more B given for a semester average of C given for a semester average of D given for a semester average of F given for a semester average of 59 or less. Attendance You are expected to attend class. If you must miss a class, it is your responsibility to find out what material was covered and to learn it. In general, a student may be dropped by his or her instructor for excessive unexcused absences or for disciplinary reasons. See "Withdrawal" below. Class Participation Students are expected to participate in class by attending, asking questions, contributing suggestions and ideas, and participating in group work. The quality of a student's class participation may be used in determining part of the student's "daily work" grade. Withdrawal In this class, if you are absent more than four times, no matter what the reason, your instructor may drop you. However, he may not. Therefore, if you stop attending and want to be certain that you don't get a grade of F recorded for the course, you should officially drop the class yourself by completing the necessary form in the Registrar's Office. The withdrawal deadline is Monday, November 26, After the withdrawal deadline, neither the student nor the instructor may initiate a withdrawal. Reinstatement Once withdrawn from the class, a student can only be reinstated in two situations: (1) At the student's request, if the student had some documented emergency or tragedy that prevented the student's participation in class for a period of time and had not exceded six absences or missed any major tests prior to that period of time. (2) If the withdrawal was made by instructor or college error. In either case the student is responsible for all missed assignments and must complete remaining assignments and tests on schedule. 7 (Thomason MATH 1314 College Algebra, p. 7 of 8) Testing Center Policy Under certain circumstances, an instructor may have students take an examination in a testing center. Students using the Academic Testing Center must govern themselves according to the Student Guide for Use of ACC Testing Centers and should read the entire guide before going to take the exam. To request an exam, one must have: ACC Photo ID Course Abbreviation (e.g., ENGL) Course Number (e.g.,1301) Course Synonym (e.g., 10123) Course Section (e.g., 005) Instructor's Name Do NOT bring cell phones to the Testing Center. Having your cell phone in the testing room, regardless of whether it is on or off, will revoke your testing privileges for the remainder of the semester. 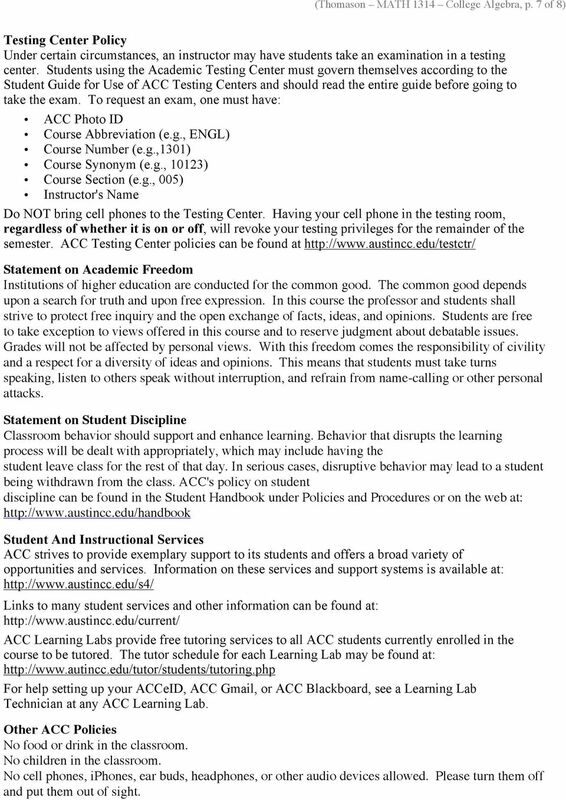 ACC Testing Center policies can be found at Statement on Academic Freedom Institutions of higher education are conducted for the common good. The common good depends upon a search for truth and upon free expression. In this course the professor and students shall strive to protect free inquiry and the open exchange of facts, ideas, and opinions. Students are free to take exception to views offered in this course and to reserve judgment about debatable issues. Grades will not be affected by personal views. With this freedom comes the responsibility of civility and a respect for a diversity of ideas and opinions. This means that students must take turns speaking, listen to others speak without interruption, and refrain from name-calling or other personal attacks. Statement on Student Discipline Classroom behavior should support and enhance learning. Behavior that disrupts the learning process will be dealt with appropriately, which may include having the student leave class for the rest of that day. In serious cases, disruptive behavior may lead to a student being withdrawn from the class. 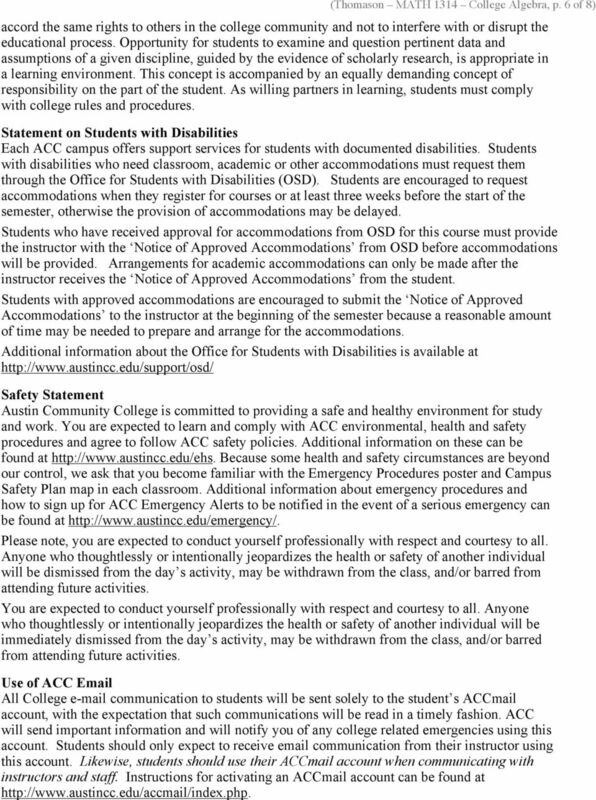 ACC's policy on student discipline can be found in the Student Handbook under Policies and Procedures or on the web at: Student And Instructional Services ACC strives to provide exemplary support to its students and offers a broad variety of opportunities and services. Information on these services and support systems is available at: Links to many student services and other information can be found at: ACC Learning Labs provide free tutoring services to all ACC students currently enrolled in the course to be tutored. 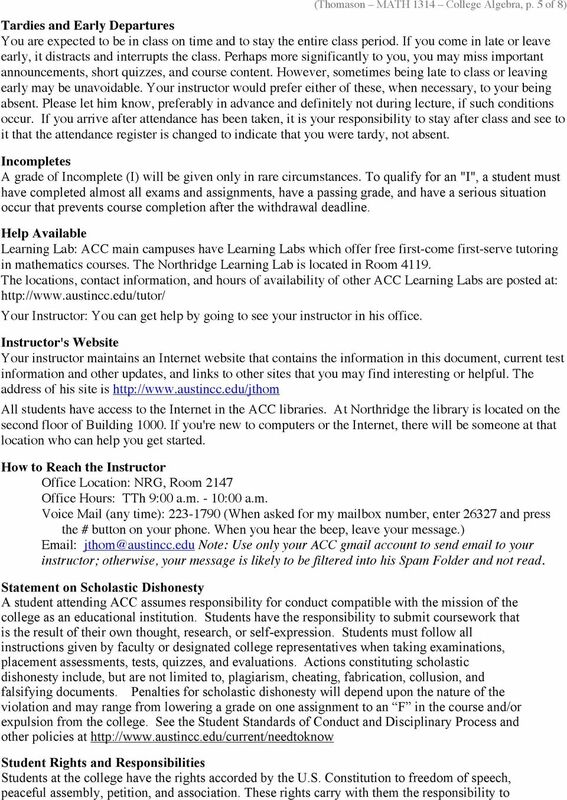 The tutor schedule for each Learning Lab may be found at: For help setting up your ACCeID, ACC Gmail, or ACC Blackboard, see a Learning Lab Technician at any ACC Learning Lab. Other ACC Policies No food or drink in the classroom. No children in the classroom. No cell phones, iphones, ear buds, headphones, or other audio devices allowed. Please turn them off and put them out of sight.